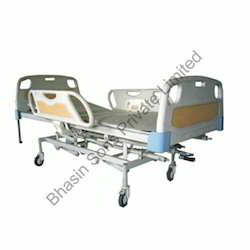 Leading Exporter of icu bed electric dx., icu bed motorized, hi-lo intensive care bed, icu bed electric cpr function, icu bed semi fowler and hospital beds from New Delhi. We hold the expertise in manufacturing a wide range of ICU Bed Electric Dx. The ranges of products are manufactured using superior grade stainless steel materials along with wheels for moving this product to everyplace. Our product is provided with splendid protection work done at the both sides of the bed. Fine adjustments are done in raising and lowering the bed, for the convenience of the customers. These products find their applications at intensive care units at hospitals. Overall Size: 210L x 90W x 60-80Hcms. Four section top perforated CRCA MS sheet. Removeable type collapsible safety side railing. Telescopic S.S. Saline rod with 4 locations. Mounted on four castors of 12.5 cms dia (two with brakes). 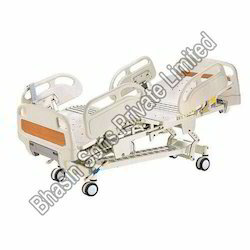 We are efficient in manufacturing and exporting ICU bed motorized widely. These are manufactured with utmost care and requirements of the patient comfort. It is intelligently designed with different specification. This is very easy to access from one place to another. More over the height is easily adjusted according to the patient continents and fine wheels at the bottom which are known for its frictionless performance. Suitable for mattress size section perforated top. 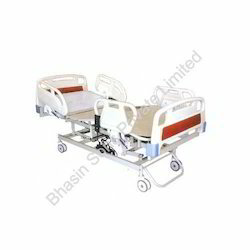 We hold the expertise in manufacturing and exporting ICU Bed Electric CPR Function. This bed is popular for its composite structure. It is provided with effective motors for safe voltage which consumes minimum power consumption. The beds are innovatively designed by cold rolled steel plates which are constant and reliable. 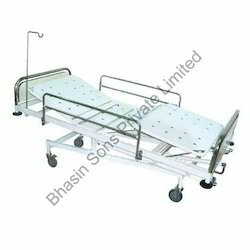 These are kinds of modern beds are applicable in operation theaters and ICU’s of multi-specialty hospitals. 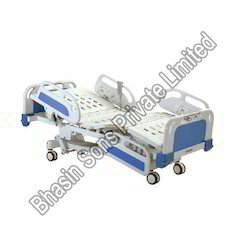 Our organization is involved in manufacturing and exporting a wide range of ICU Bed Semi Fowler. Having sound infrastructure facilities, we monitor the quality of the product, we manufacture. The product is featured with attractive wheels and bendable surface of steel bed. This model is fully designed up of electrical equipment which automatically adjust according to the patient comfort. These products are used at multi specialty hospitals. Overall Size: 210L x 90W x 60Hcms. Three separate screw levers for manoeurving backrest, kneerest, trendlenberg & R-Trend positions. Removeable type Up & Down safety side railing. Mounted on four castors of 12.5 cms dia two with brakes. 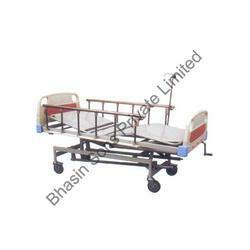 Hospital Ward Plain Bed (General), which is durable and rust-free. Looking for ICU Beds ?